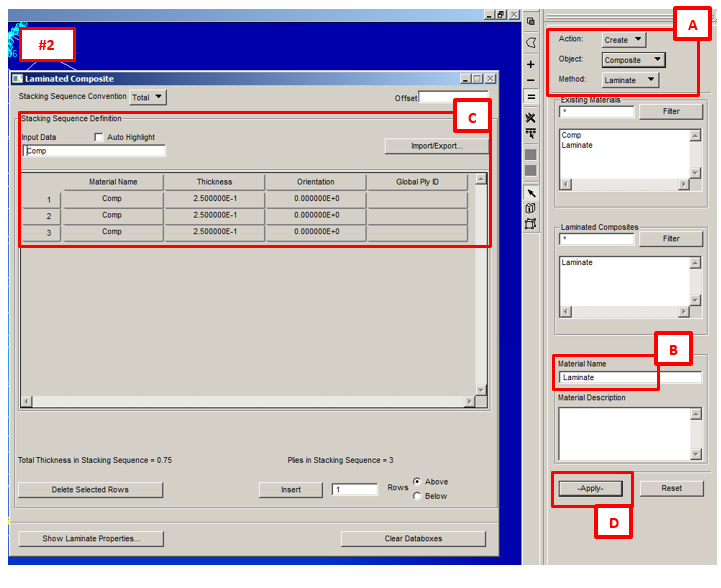 This article deals with strength criteria for composite materials supported by FEM analysis Some numerical example is shown by using MSC Nastran/Patran software. The most important criteria are explained and then a comparison by numerical results is performed. 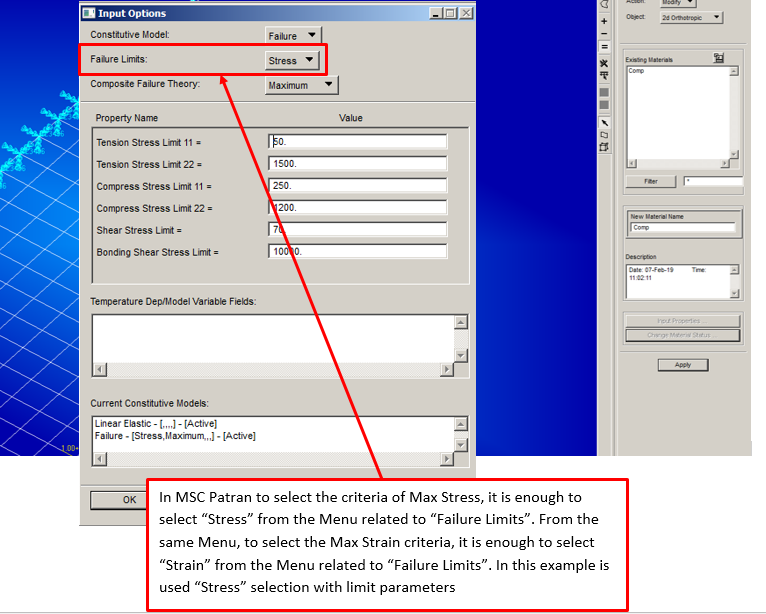 In order to perform a numerical comparison amongst these criteria a simple model has been created by MSC Nastran/Patran. Definition of composite material: A composite material is a material made from two or more constituent materials with significantly different physical or chemical properties that, when combined, produce a material with different characteristics from the individual components. In the Aerospace industry is used usually the CFRP (Carbon Fiber Reinforced Plastic) that is an extremely strong and light fiber-reinforced plastic which contains carbon fibers. The binding polymer (Matrix) is often a thermoset resin such as epoxy, but other thermoset or thermoplastic polymers, such as polyester, vinyl ester, or nylon, are sometimes used. 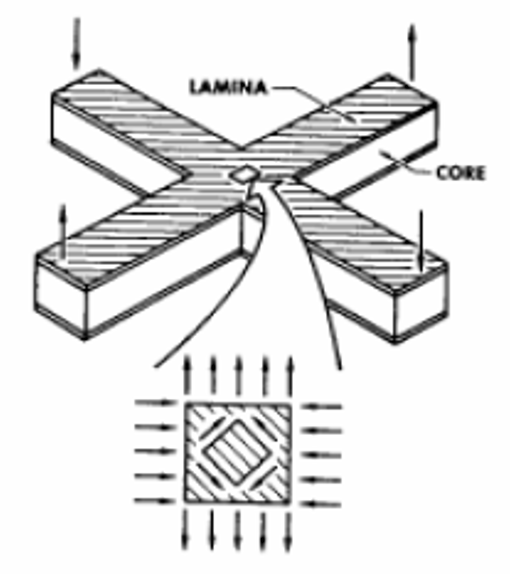 Definition of Lamina: In materials science, a composite laminate is an assembly of layers of fibrous composite materials which can be joined to provide required engineering properties, including in-plane stiffness, bending stiffness, strength, and coefficient of thermal expansion. 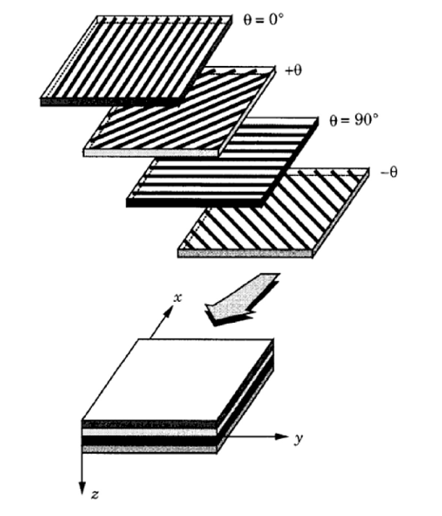 A laminate is a stack of individual plies having a set of ply orientations (commonly 0°, 45°, 90°). 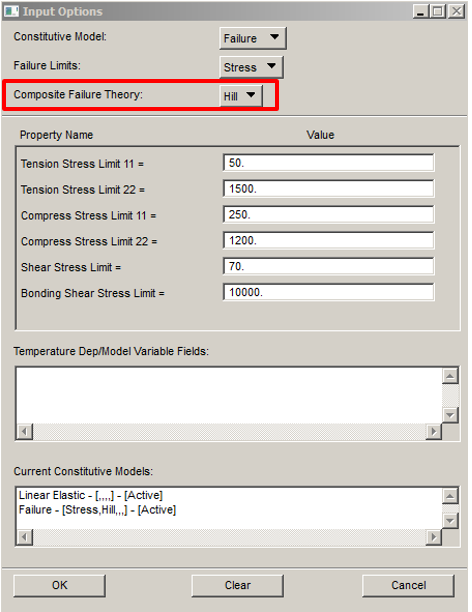 A simple model is used; it is made up by 3 plies with orthotropic properties with the goal to compare the criteria valid for the composite materials. 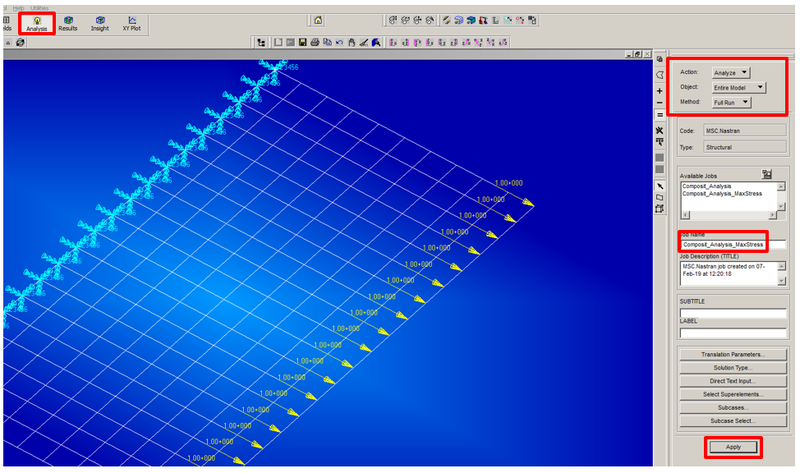 The model is a rectangular plate loaded by an axial distributed load along Y-axis of coordinate system. This is a “not interactive” criteria. 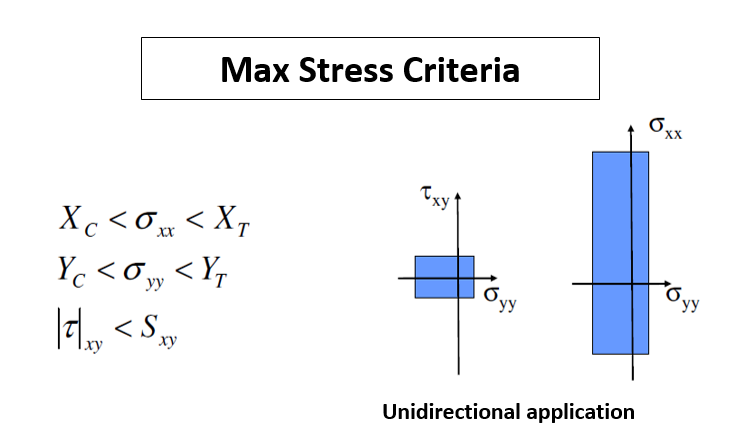 Indeed, every single stress or/and strain is separately compared with an allowable value (X- Y- XY- directions). This criterion is not conservative because it doesn’t take into account the interaction amongst the stress/strain components. 4) Then create the BDF text file for the next run with Natran, see below for the selection under Patran (leave SOL101 under “Solution type…”). Note: if you got a fatal for the Nastran run like that one shown below, probably you should to erase the NU21 in the MAT8 card. 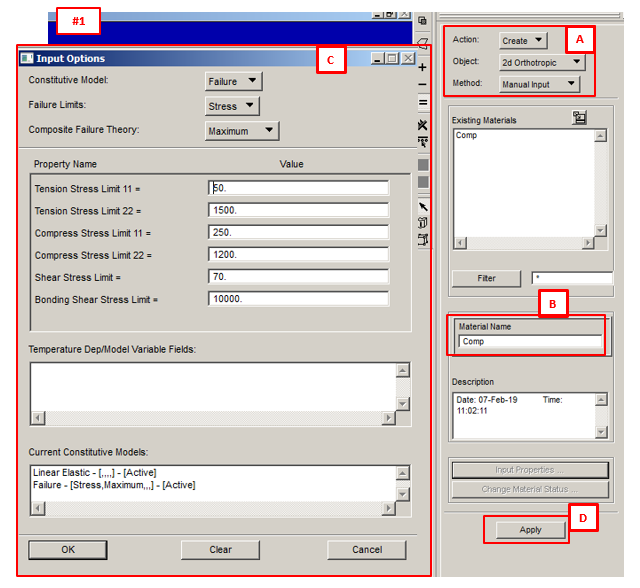 Useful exercise is to study by the Nastran-Quick Reference Guide (https://simcompanion.mscsoftware.com) the PCOMP card format (reported below). Highlighted in yellow the field related to failure criteria. 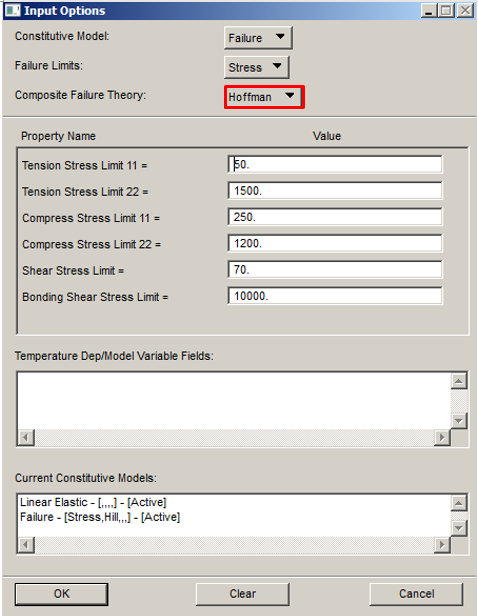 A F06 file is created as result of Nastran run. 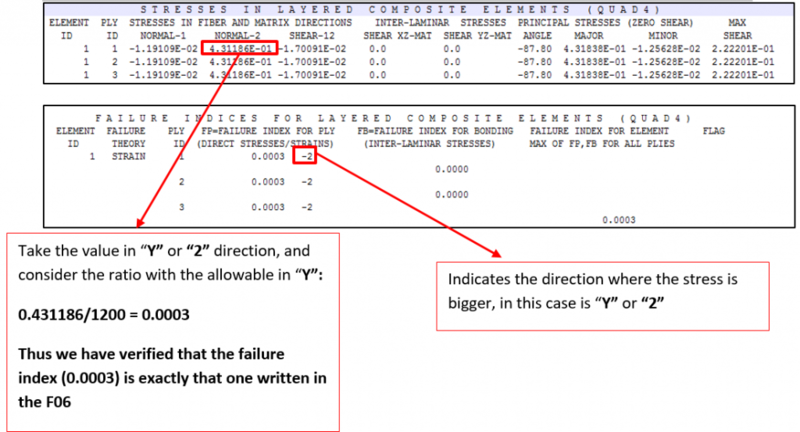 In this file are printed out the Failure Index. The Failure index indicates if the rupture limit is reached for each single lamina (in this case we have 3 plies) and for the matrix that bonds the fibers together. If the index is lower than 1, then the structure is not critical, on the contrary if is bigger than 1 there is a failure. This criterion is a quadratic or energetic criteria, also so-called “interactive” criteria. It is similar to Von Mises criteria used for isotropic material. 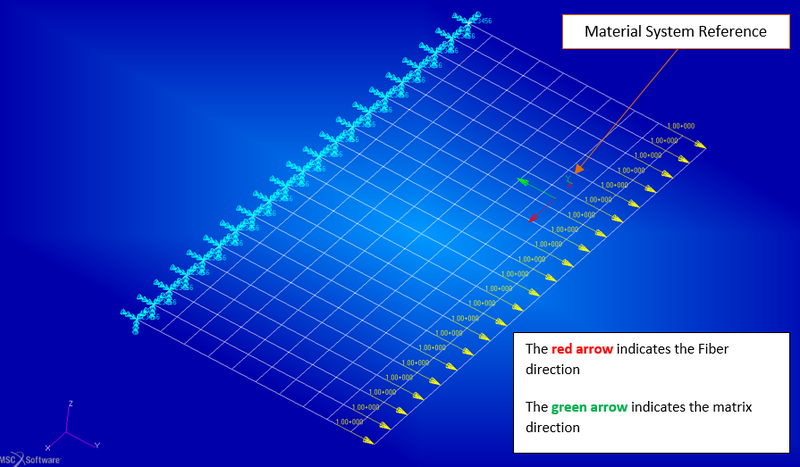 This criterion is a 2D criteria (XY plane), based on the hypothesis that the material is isotropic in the transversal direction (strength in Z-direction equal to Y-direction). 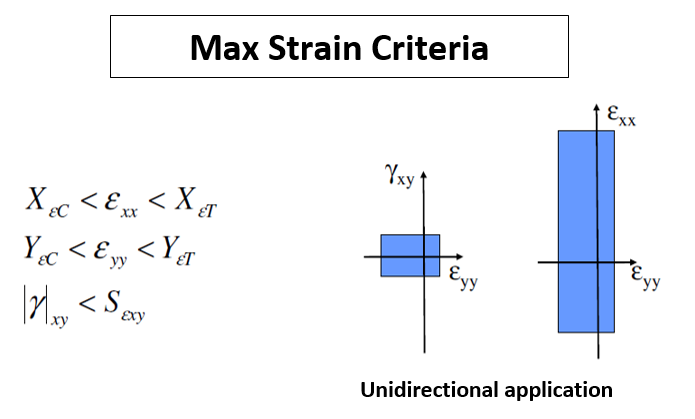 Also in this case for our numerical verification is used the same FEM, and same boundary conditions used above for the Max Stress/Strain criteria. Except obviously for the criteria definition selected for the material (see below). 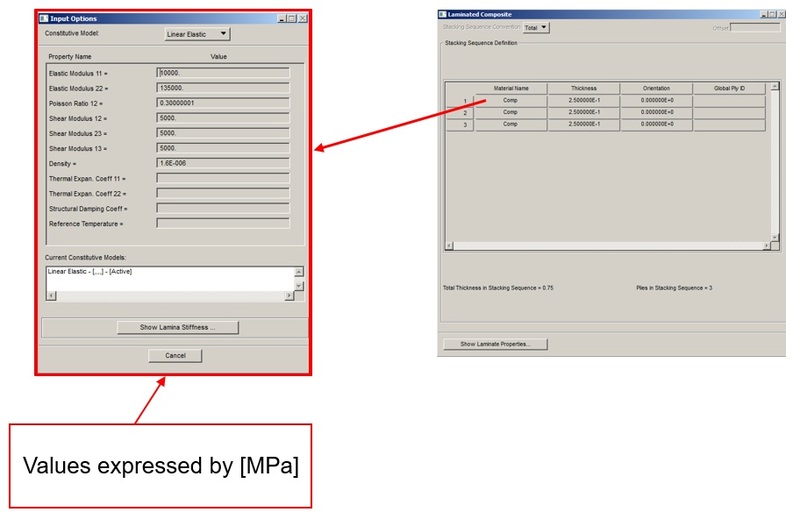 Likewise done for the Max Stress/Strain criteria, we take the Element ID=1 and ID=2, in order to compare the index values with those ones of Max Stress Criteria for the same loading. 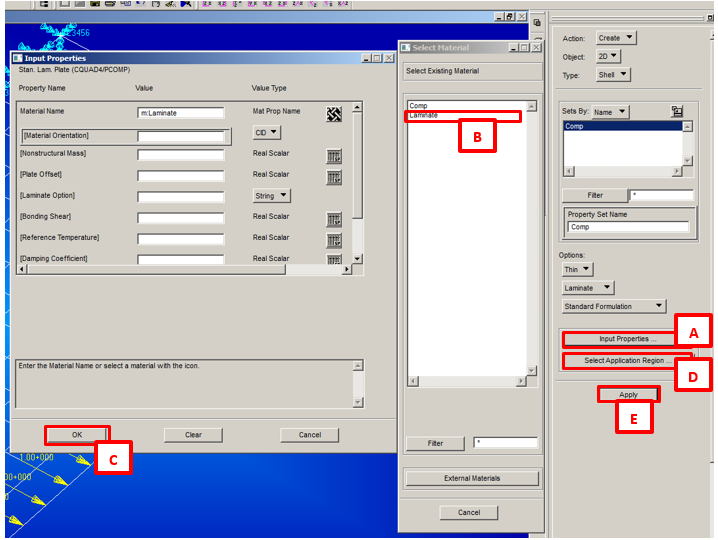 The 9 parameters are determined by 9 experimental tests: XT, XC, YT, YC, SXY, SYZ, SZY. The 9 parameters could be determined by 9 experimental tests: XT, XC, YT, YC, SXY, SYZ, SZY. 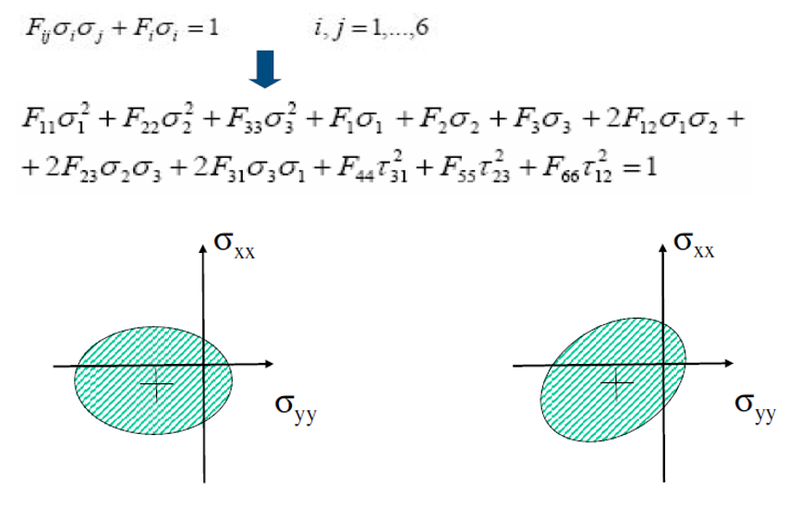 To determine the coupled factors (F12, F23, F31), biaxial traction tests are needed. However often these parameters are set to zero because the results present good correlations with experimental tests. 1st: total load of 21 N, 1N for each node ; 2nd: total load of 21*104 N, 103 N for each node. 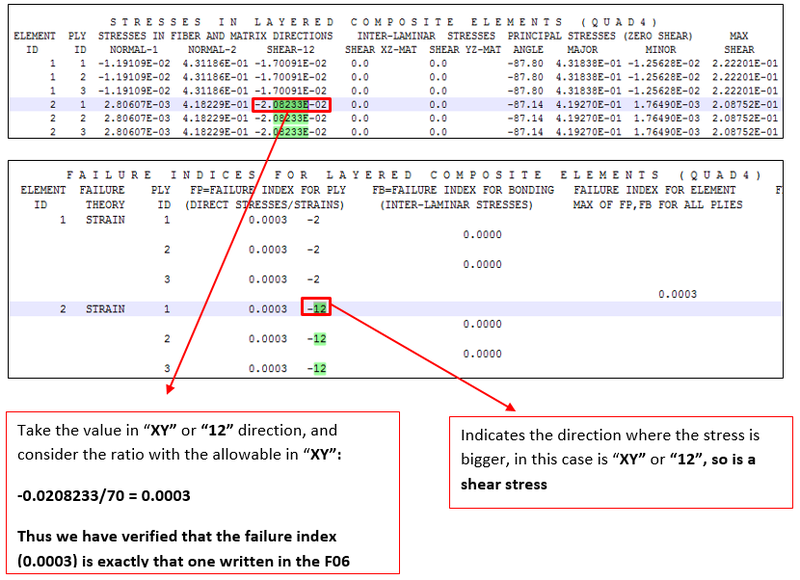 The Hoffman and Tsai-Wu criteria give similar failure indexes, for high and low loads. 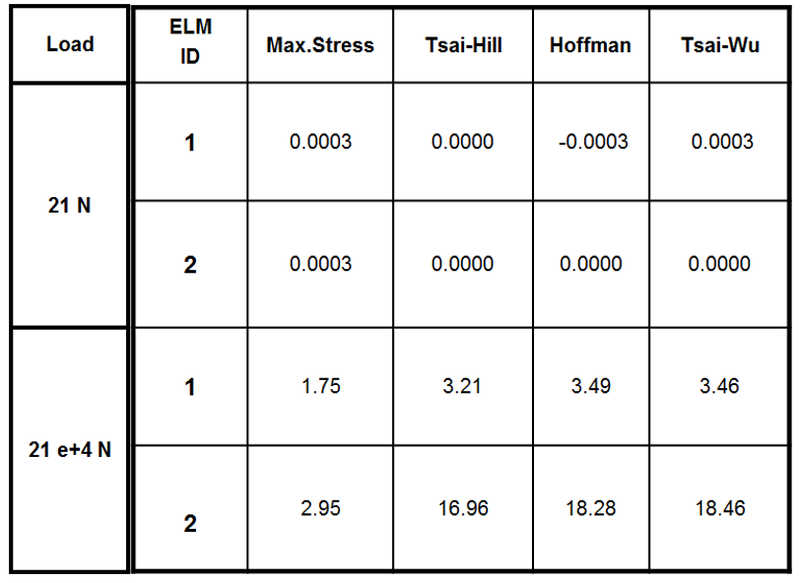 For high critical loads, Hoffman/Tsai-Wu give bigger failure indexes than Max Stress and Tsai-Hill, therefore are more conservative. A further checks have been performed by considering a different orientation of the plies: [+45°/0°/-45°] ; [45°/0°/90°]. For the stacking [0°/0°/0°], Hoffman and Tsai-Wu give higher failure indexes, therefore in this case are more conservative. For the stacking [+45°/90°/-45°] and [45°/0°/90°] instead, Tsai-Hill gives higher failure indexes, therefore in this case is the most conservative. 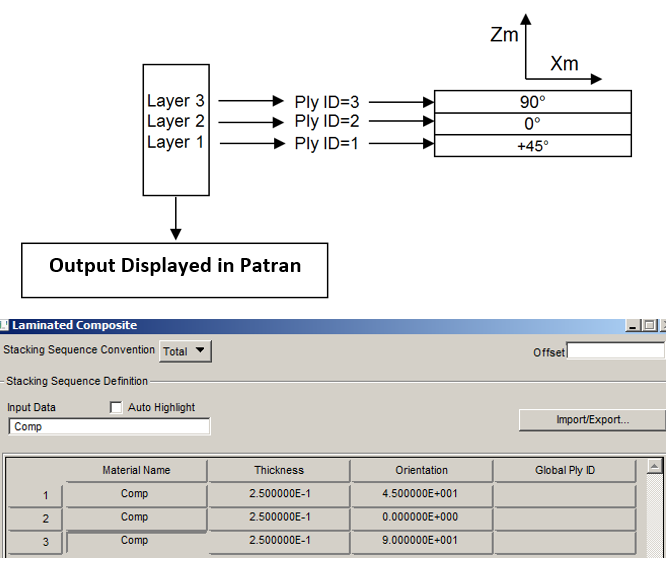 The stacking sequence in Patran is structured in order to the Ply ID=1 is that one with the most negative value of Zm-axis (material system), hence the stacking has sequence from the bottom to the top according the direction of Zm-axis. 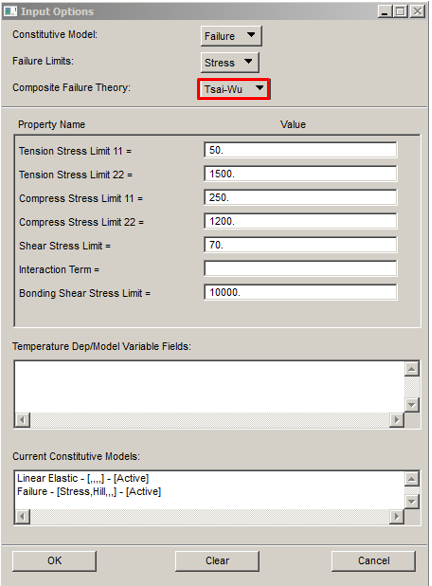 This entry was posted in FEM - Analysis and tagged analysis, BDF, Composite, Criteria, failure, FEM, hill, Hoffman, index, Lamina, material, Max, MSC, NASTRAN, patran, PCOMP, SOL101, strain, strength, Stress, Tsai, Tsai-Hill, Tsai-Wu, Wu. Bookmark the permalink.